ECI’s National Elections Quiz 2018 Inter-School Competition witnesses participation by 13. Delhi Public School, Ranchi team were declared winners of the National Elections Quiz 2018 organised by the Election Commission of India. 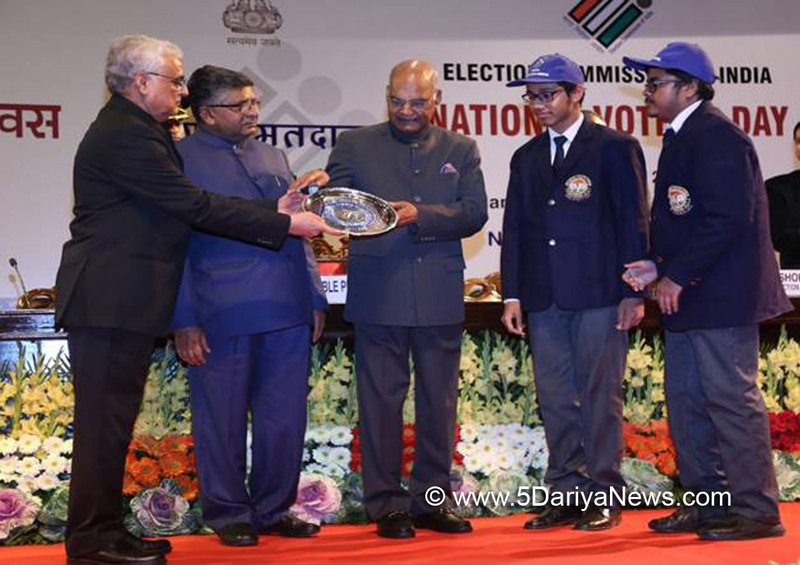 DPS Ranchi teamcomprising Madhur Jain and Aditya Kumar, were handed over the NEQ 2018 Trophy by the Hon’ble President of India during the National Voters’ Day function held at New Delhi.Team from DPS Ranchi being handed over the Trophy by the Hon’ble Presdent in presence of Shri Ravi Shankar Prasad, Minister of Law & Justice and Shri O P Rawat, Chief Election CommissionerClocking participation of 13.63 lakh students from 38,000 schools, the National Elections Quiz 2018, organised by the Election Commission of India andspanning over two and a half months, culminated in a thrilling finale between the six School teams from Delhi, Goa, Jharkhand, Jammu & Kashmir, Manipur and Puducherry.Securing 105 points, the team from Delhi Public School, Ranchi comprising Madhur Jain and Aditya Kumar, were crowned the Champions in the NEQ 2018. St. Patric Matric Higher Secondary School from Puducherry, comprising V. Vishnu Priya and R. Mithun Krishna sealed the second place while Jawahar Navodaya Vidyalaya, Senapati, Manipur comprising Ashmaan Mainali and Shangker Singh Laishram secured the third place. Besides the Trophy, the First Prize carries a cash prize of Rs 1 lakh, first runners up - Rs 80 thousand, and the Second runners up Rs 60 thousand. The remaining three teams in the Grand Finale were rewarded Rs. 50 thousand each. Half the amount of the Prize money goes to the School and the rest to the two students comprising the team. The National Elections Quiz is organized as part of ECI’s initiative of ‘Empowering Young and Future Electors’ which was also the theme for the 7th National Voters’ Day (2017). Extending from the Intra-School followed by the District and State Level right up to the National Rounds, NEQ involved students from across the country laying claim to being the World’s Largest Inter-School Quiz Contest on Elections.The 36 teams from all the States and Union Territories comprised of 72 students from Class 9-12th, falling in the category of future voters, which are one of the target audience for ECI’s Systematic Voters’ Education and Electoral Participation programme (SVEEP). As a part of their visit to Delhi, the participants were taken on a guided, educational city tour to the Rashtrapati Bhavan, Qutub Complex, Elections Museum, Red Fort, Gandhi Smriti, Humayun’s Tomb and the Birla Mandir.The 6 Zonal-Finals and the Grand Finale were conducted in collaboration with the Rajya Sabha TV. The North-East Zonal, also the first episode, was telecast on RSTV on the 8th National Voters’ Day and the remaining 5 zonals and the Grand Finale is being telecast in the coming six weeks, every Sunday and also available on YouTube. The Grand Finale will be aired on RSTV on 11th March 2018 and also live-streamed on Facebook India page.